Aunts are one part mother and one part friend! They are truly a beautiful gift. 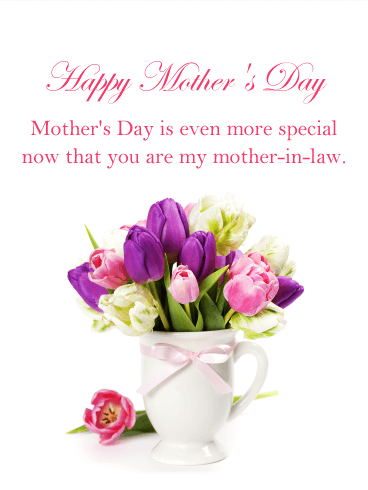 Send this pretty Mother's Day card to your aunt; the charming bouquet of flowers will melt her heart. Your sweet words will refresh her spirit. Don't forget to share the love with your aunt this Mother's Day! 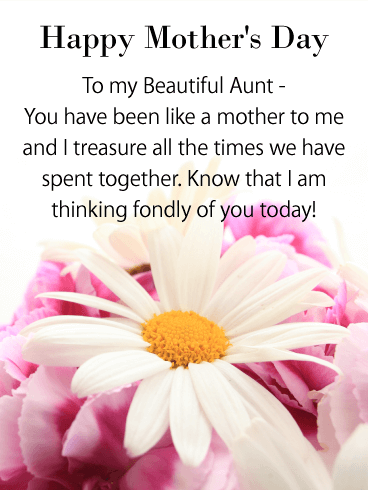 Send a beautiful Mother's Day card to your aunt today. 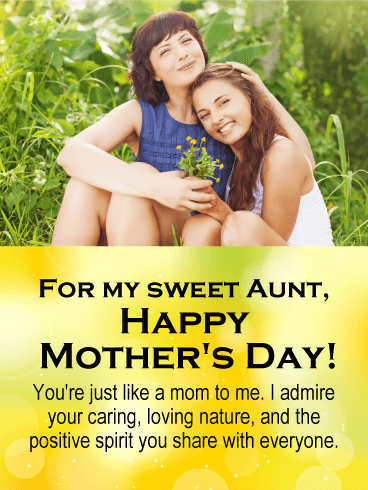 A simply beautiful Mother's Day greeting card for your aunt. 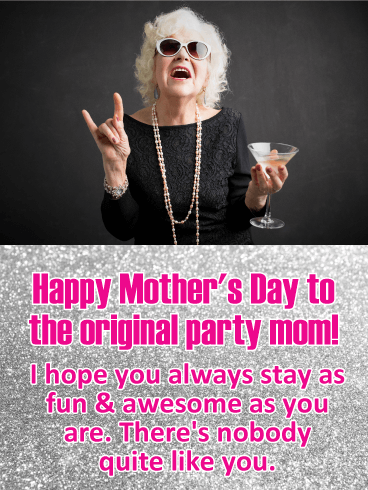 If your aunt has been like a mother to you, send her this card and let her know. Tell her you are thinking of her fondly. Aunts are a lot like mothers! They encourage and support us. 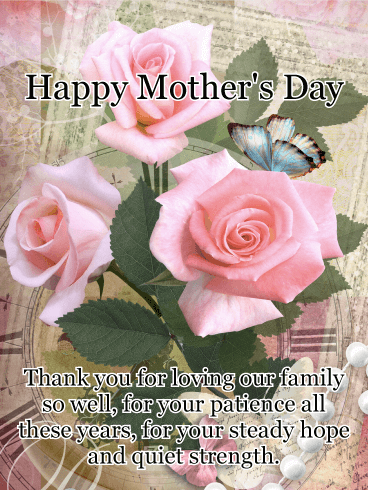 Wish your aunt a beautiful Mother's Day with this sweet Mother's Day card. Gorgeous tulips adorn this cheerful Mother's Day greeting card for a special aunt. 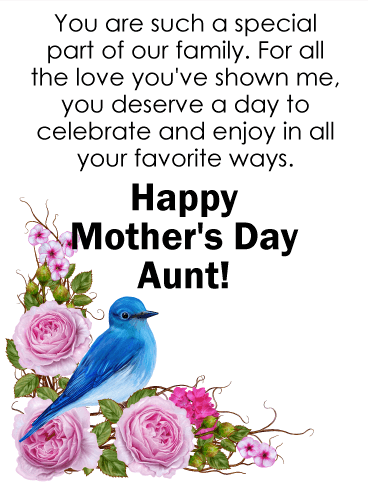 Send your aunt a Mother's day card to let her know how special she is to you! 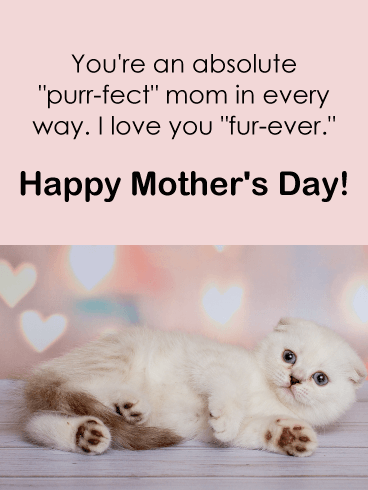 Your aunt is a wise and kind woman who deserves a bit of extra love on Mother's Day with a thoughtful card just for her! Send it now and light up her life with warm Mother's Day wishes. 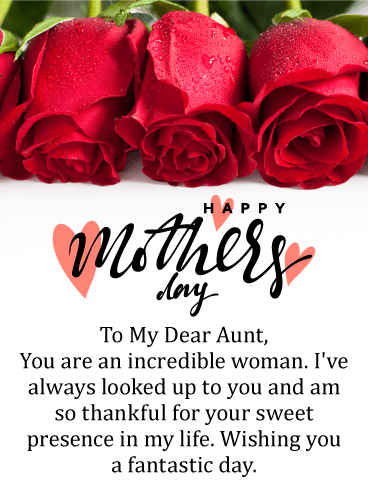 Aunts make our lives rich and full indeed! 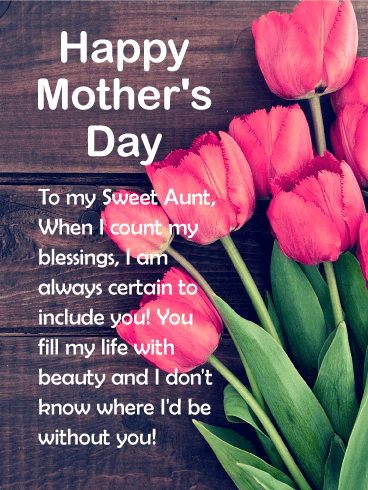 Send your sweet aunt a gorgeous Mother's Day greeting card to let her know she means the world to you. 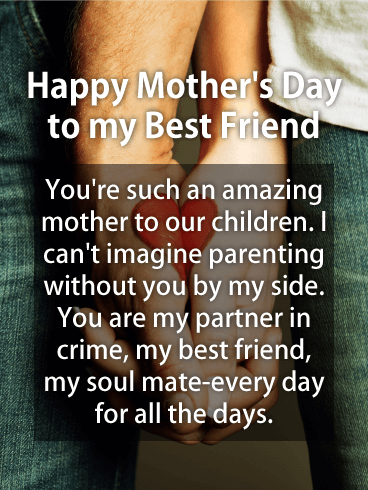 This amazing Mother's Day card has a great message for your favorite aunt. Let her know you count her as one of your top blessings in life! 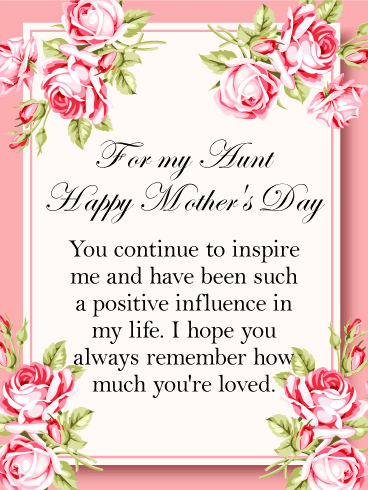 Add beauty to your aunt's life when you send her a meaningful and beautiful Mother's Day card today. Stunning roses for a fantastic aunt on Mother's Day! 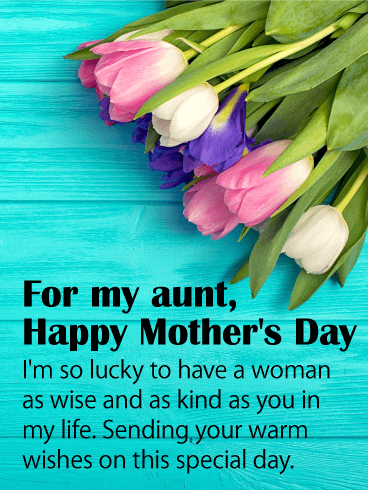 This gorgeous Mother's Day card for an aunt is a lovely to celebrate this special day. 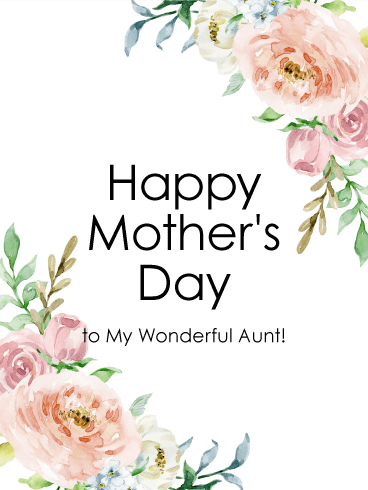 If you are thankful for your aunts presence in your life, then wish her a fantastic Mother's Day and tell her! Her heart will glow with happiness to hear these sweet words. Aunts are one of life's most beautiful gifts. They teach us and help us grow into amazing women ourselves. Don't forget your aunt this Mother's Day! 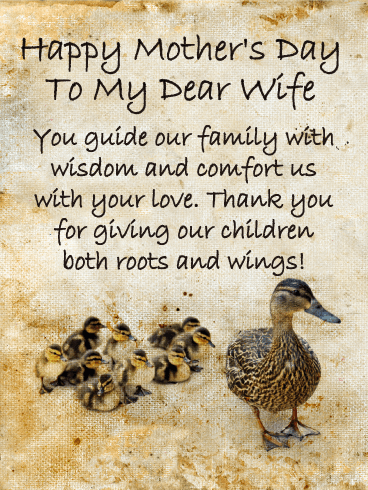 Let your mother-in-law know how thankful you are to have her in your life with this gorgeous Happy Mother's Day card. 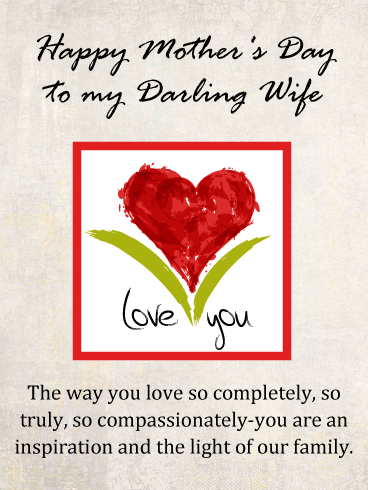 She will certainly appreciate that her daughter-in-law took the time to send something her way on Mother's Day! Exquisite pastel pink roses frame the meaningful message that tells your mother-in-law how wonderful she is. 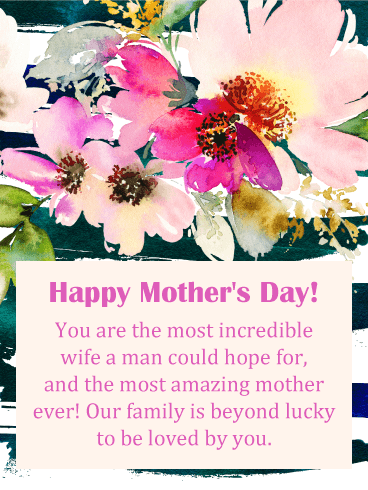 Make her day by sending this pretty Mother's Day card to her today! 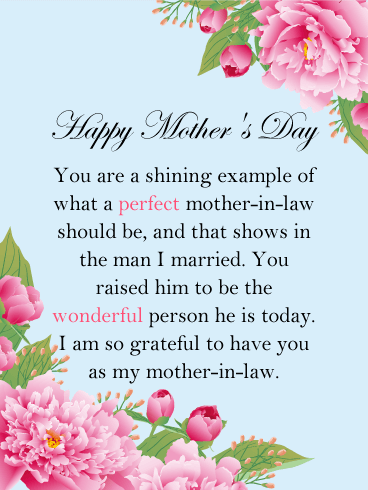 You can see that your mother-in-law is a shining example of what a mother should be, and a beautiful Mother's Day card would be a great opportunity to tell her. It features wonderful pink flowers against a powder blue backdrop, so pretty! Your mother-in-law will adore you, her daughter-in-law, for sending it to her. 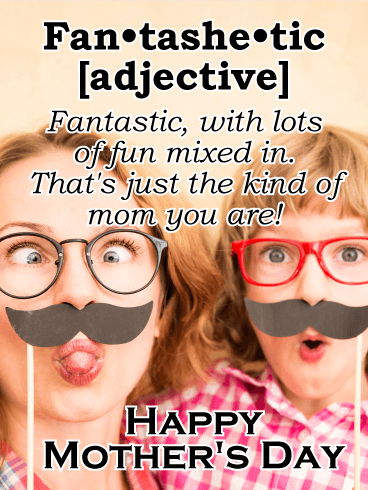 This special day is all about her so she deserves a fabulous Mother's Day card such as this. Ever since your mother-in-law has been in your life, Mother's Day has been even more special. You have another person in your life that cares about you! 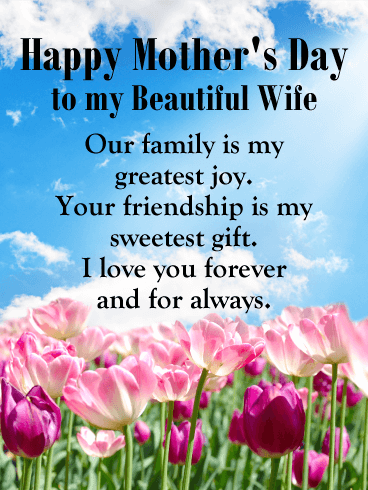 Now it's time to let her know that you, her daughter-in-law or son-in-law, appreciates and cares about her also. Sending this fabulous Mother's Day card with pink and purple flowers that are arranged beautifully, will certainly make her feel special! 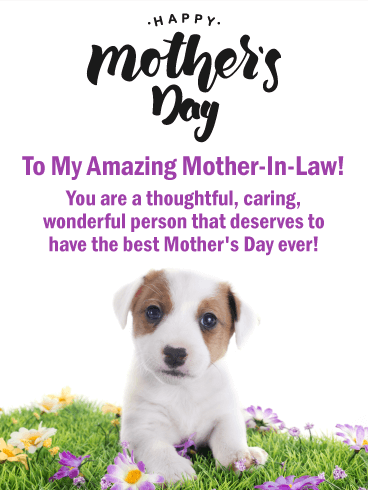 Make your mother-in-law smile on her special day by sending this cute puppy her way on Mother's Day. She will love that her daughter-in-law cares enough to send the very best. 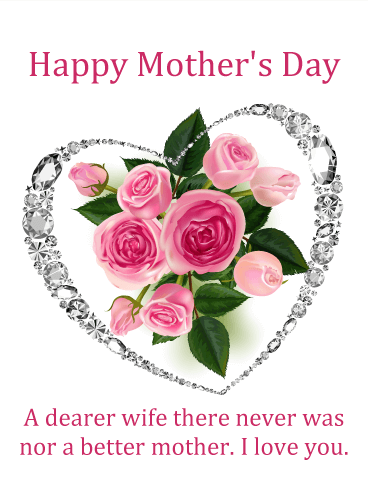 It features a sparkling pink background and lets her know you are thankful for having such a terrific mother-in-law. 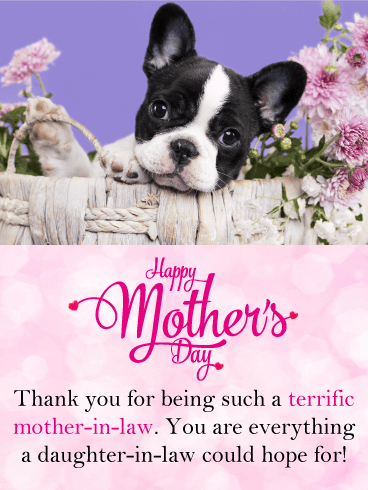 The puppy and flowers are the final touches that make this Mother's Day card worth sending! 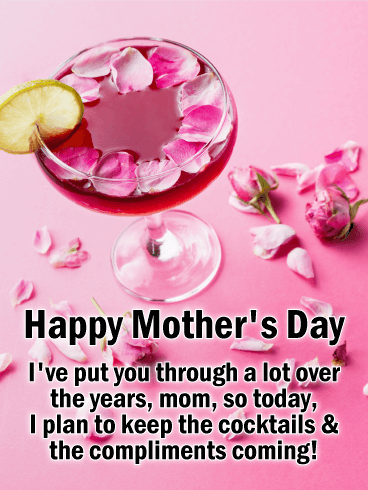 Mother-in-laws are known for their great advice, as well as how loving they are, and this day is all about letting her know how much you appreciate it. 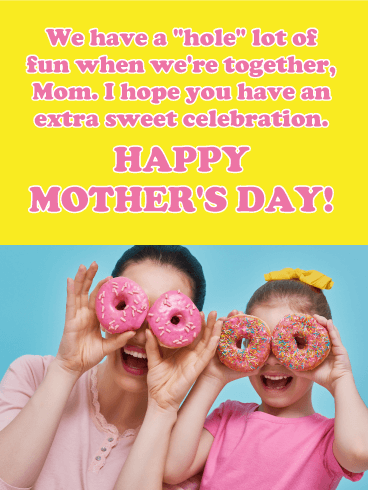 As her daughter-in-law, this is your chance to show how much you care by sending this spectacular Mother's Day card that features pink tulips with a Happy Mother's Day note in the center. 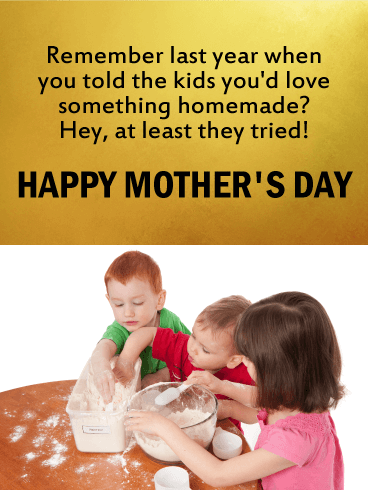 Your mother-in-law will think this Mother's Day card is beautiful! 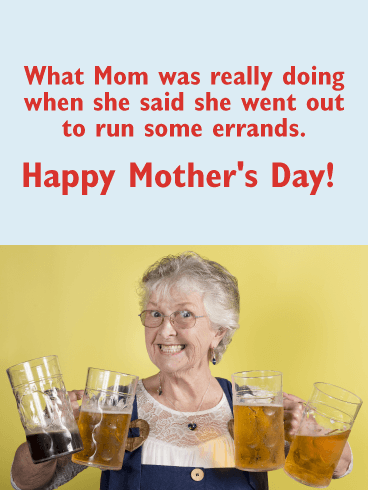 If you are a son-in-law looking for a great Mother's Day card to make your mother-in-law happy, you just found it! 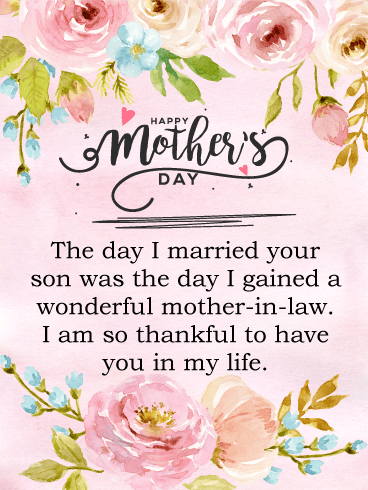 This Mother's Day card was designed specifically for a son-in-law that wants to wish his wonderful mother-in-law a fantastic day. It features a man handing flowers to someone, his mother-in-law! She is going to love it! 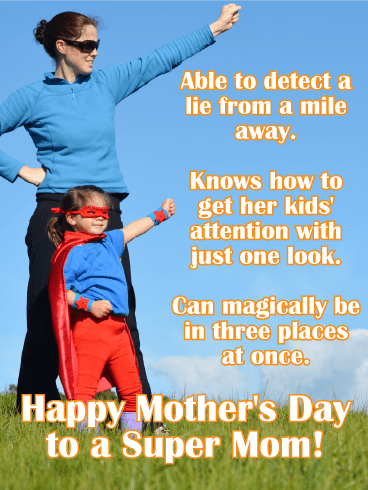 This Mother's Day card will certainly make her smile! 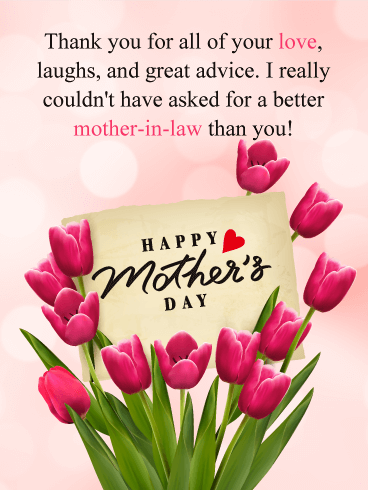 This special day comes around once a year, so make sure to send a Mother's Day card that your mother-in-law will absolutely love! 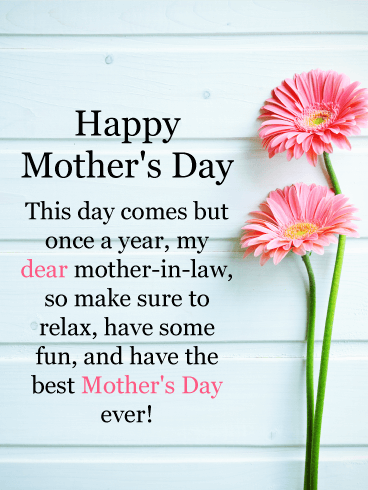 This Mother's Day card wishes your mother-in-law a relaxing and fun day. It's exactly what she needs! 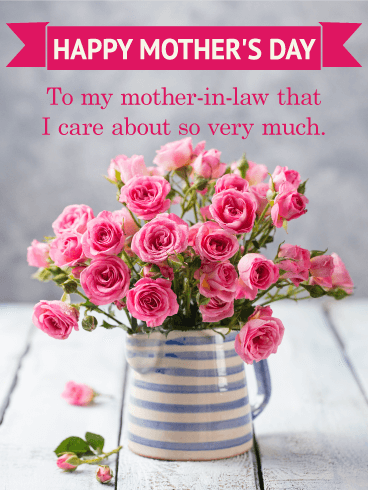 The colors of gray, blue and pink are a special combination of colors that makes this Mother's Day card appropriate to be sent by a son-in-law or daughter-in-law! 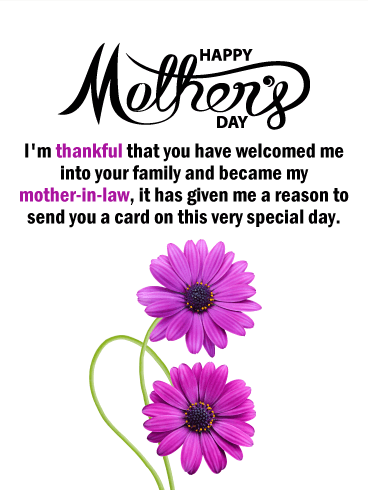 Being welcomed into a new family and gaining a mother-in-law is wonderful, especially when Mother's Day is here! This gives you a reason to send your mother-in-law a Mother's Day card that will tell her how thankful you are that she is in your life! 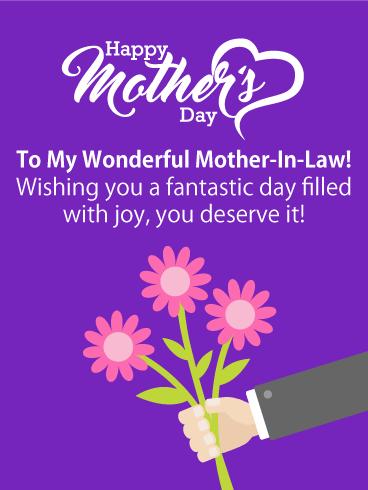 This simply eloquent Mother's Day card with purple daisies will make your Mother-in-law very happy and fill her heart with joy! 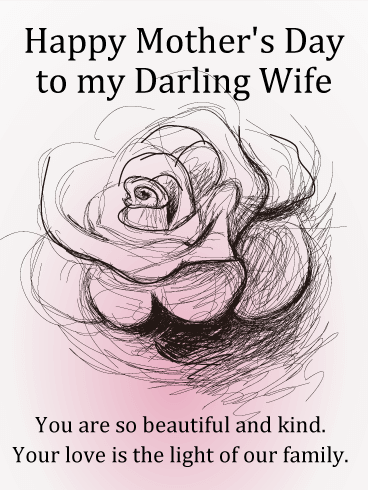 This terrific Mother's Day card was designed for the mother-in-law you care so much about. It features exquisite pink roses that look exceptional against the gray background. The striped vase gives this Mother's Day card a creative touch that your mother-in-law is going to love! The gray background makes it a great option for a son-in-law to send, and the pink flowers make it suitable for a daughter-in-law! 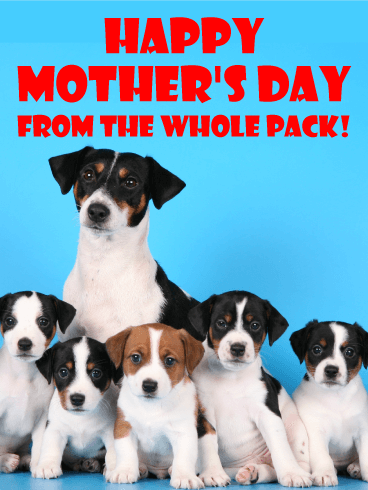 Everyone loves a cute puppy, so this means your mother-in-law will adore this Mother's Day card! The colors of black and purple make it perfect for a son-in-law that wants to impress his mother-in-law, but can also be sent by a daughter-in-law, because it's so sweet! It shows your mother-in-law how you feel she is a thoughtful and caring person, it will make her so happy! 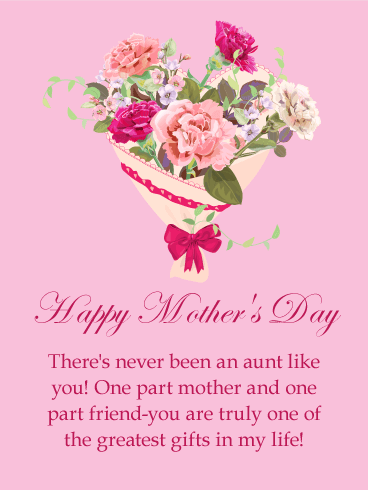 For an aunt who means everything to you, here is a Mother's Day card that will mean so much to her. Beautiful watercolor flowers and a charming blue bird frame the lovely sentiment, reminding her of all that she does her extended family and letting her know how much she deserves a special day to celebrate in all her favorite ways. 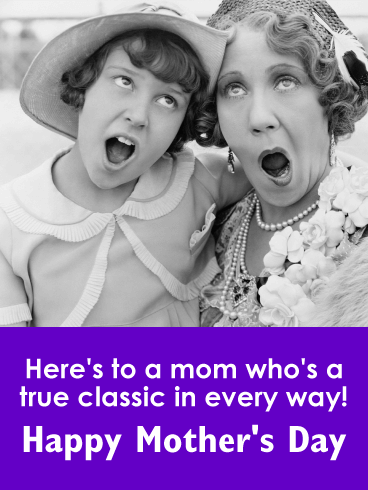 For the aunt who's just like a mom to you, this sweet Mother's Day card is a wonderful choice. The touching image of an aunt with her niece, sitting together and locked in a warm embrace, will fill her heart with happiness, knowing you took the time to celebrate her caring, loving nature and positive spirit on such a special day. 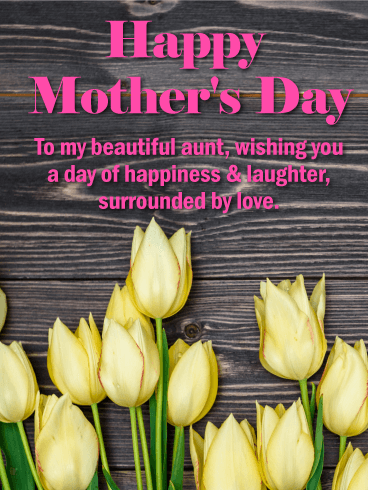 With flourishes of gorgeous pastel flowers and a simple yet heartfelt message at the center, this Mother's Day card is the perfect choice for a wonderful aunt who makes every day brighter with her smile. Whether it's sent from a niece or nephew, this is a great way for her to feel loved and remembered. A rustic wood background with cheerful yellow tulips sets the perfect scene for wishing your beautiful aunt a happy Mother's Day. Whether she's close by to celebrate or you're thinking of her from miles away, she'll appreciate the warmth of your words and the kindness of your sentiment. 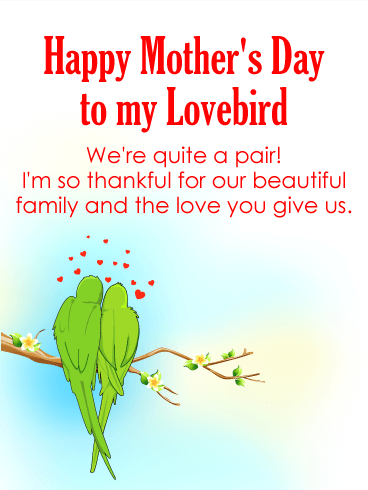 This beautiful Mother's Day card will have a special aunt in your life feeling loved. A frame of pink flowers adds a charming touch to the inspired words in the center. It's a way to let her know how much of a difference she continues to make in your life, and that she will always be someone you look up to because of the kindness of her spirit and the warmth of her heart.